Grottos, semi-subterranean follies decorated with shells and other bric-a-brac, were a popular building project in the eighteenth century. Scott's Grotto in Ware and the grotto in Painshill Park, Surrey are among those that can still be visited. London had its own take on these underground amusements which are now almost entirely forgotten. The “Fairy Grotto” of Oley Place, Stepney Green was built by, ironically, a shoemaker called Devey in a yard by his home. He made mosaics from “broken plates, and dishes, cups, saucers and other household refuse, bottle bottoms, stained glass and so on” and had water constantly trickling through a stalactite cave constructed of putty. “Mr. Devey may be congratulated upon the patience and labour he has devoted to the work” ” cheered the City Press on 17 October, 1874. A “very curious grotto” was under an old house on Knightrider Street, EC4, which is off New Change, near St Pauls Cathedral. 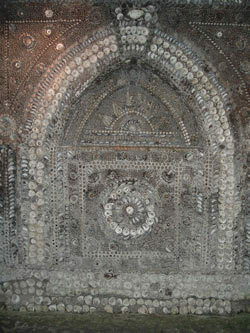 A low brick arch was, like Margate Shell Grotto, covered in shells and the side walls had stone tables projecting from them. Then a low narrow archway led to a very small chamber which was, again, covered in shells but these were arranged more into a pattern. There were (or still are) arched opening in the walls, one of which had a small fount in it. The layout is similar to Margate Shell Grotto, without the twin passageway, skylight, long train journey or soul-destroying walk through Margate town centre to get to it. However the Knightrider Street grotto did not claim to be ancient like the Kentish grotto, the City Press reported, in 1 November 1873, that the grotto was believed to have been constructed “two years after the Great Fire of London” so in 1668. Is it still there? Ancient parts of London are constantly rising up to surprise us, so are the footsteps of city workers unknowingly echoing in decorative caverns as they slip out for a lunchtime pint at the Centre Page? If you can find out, we'd love to be the first to know. Beware though, Knightrider Street was used as a location in the 1968 Doctor Who episode, "The Invasion" which featured Cybermen invading the City of London by bursting out of London's sewers.